Photojournalist Piero Ribelli came to the United States from Italy in 1985, with a love for Jack Kerouac and The Doors and a longing to make a fresh start. As a new American citizen, he set off on an epic cross-country journey and logged 31,000 sky miles along with 16,000 more miles by car, train, or whatever means of transport happened to be necessary. His goal was to seek out an address of 50 Main Street in each of the 50 states, and to show both the diversity and unity of the American people and the places they call home. 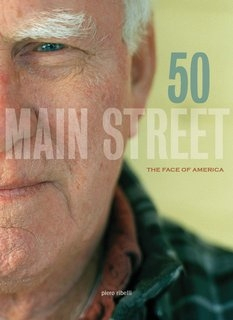 Ribelli’s 50 Main Street: The Face of America offers not only rich visual portraits of sights seen, but also heartfelt interviews with Americans who speak with Southern drawls or Yankee twangs, who cherish the vast western plains or shrug off fierce Midwestern snowstorms as just being what winter’s all about. There are Native Americans, African Americans, original Colonial descendants, and the rest of the country’s celebrated melting pot; some residents were born in their present states, while others arrived there by happenstance or part of a long life’s journey. 50 Main Street spotlights innkeepers, small business owners, doctors, volunteer firefighters, truckers, veterans, and Nebraskan Ralph Bottenfield, whose teetotaling may have helped him to celebrate one hundred birthdays. Karl from Kekoskee, Wisconsin, confirms his state’s reverence for cheese and the Green Bay Packers, while Avis from New Hampshire crisply notes: “I am a Yankee, just a damn Yankee.” Robin Tupa of Pearl Harbor explains the word “Aloha” as “the essence of relationships in which each person is important to every other person,” then gazes at the camera with a glimmer of a Hawaiian rainbow beyond her calm and friendly face. Wall Street has ravaged Main Street in recent years, just as the twenty-first century has brought some troubled times to the United States: the horrors of the September 11th attacks, wars in Iraq and Afghanistan, economic crises, divisiveness, and what often seems to be a breakdown in basic human decency. America remains influential and a world power, but Ribelli shows us how much more there is to the country than bright lights and big cities or the apoplexy of Washington, DC. How the United States still reflects its democratic motto of e pluribus unum—or “out of many, one”—and how we must not only see ourselves as living in America, but rather living together as Americans with so many stories to tell.